Chris Crawford on Game Design is all about the foundational skills behind the design and architecture of a game. Without these skills, designers and developers lack the understanding to work with the tools and techniques used in the industry today. Chris Crawford, the most highly sought after expert in this area, brings an intense opinion piece full of personality and flare like no other person in this industry can. He explains the foundational and fundamental concepts needed to get the most out of game development today. An exceptional precursor to the two books soon to be published by New Riders with author Andrew Rollings, this book teaches key lessons; including, what you can learn from the history of game play and historical games, necessity of challenge in game play, applying dimensions of conflict, understanding low and high interactivity designs, watching for the inclusion of creativity, and understanding the importance of storytelling. In addition, Chris brings you the wish list of games he'd like to build and tells you how to do it. Game developers and designers will kill for this information! When I wrote The Art of Computer Game Design way back in 1981, I really didn't know what I was doing; I wrote the book as a way to sort out my thoughts on game design. That effort helped me solidify my philosophy of game design -- and incidentally became a classic in the field. That book was a bunch of lucky guesses and inspired hunches. 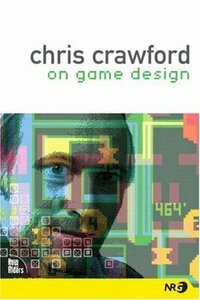 This book, by contrast, looks back on a career in game design spanning 25 years, and attempts to digest the lessons of that career. Back then, with so little experience to draw on, I was absolutely certain of my conclusions. This time around, I'm not so sure -- but I've got some humdinger stories to tell. Will this book be a classic 25 years from now? Maybe so, maybe not, but one thing I'm sure of: 25 years from now, people will still be laughing over some of the crazy design misadventures I lived to tell about.